DOLPHIN INSTITUTE PLANNING ON MOVING TO MAUI - AND STILL KEEPING DOLPHINS IN CAPTIVITY. CAPTIVITY---In preparing this letter I thought I would define the meaning of the words Captivity, Compassion, Intelligence and Freedom. However I feel that in this shortsighted society these are only words, of which their meaning may be understood, but not practiced as a way of life. Instead I thought I would compose this letter from my view as a free-spirited individual. And individual raised on a sailboat in the Hawaiian Archipelago 55 years ago. A time when the surrounding waters of Maui were once quiet, free of pollution - noise, and abundant with marine life. 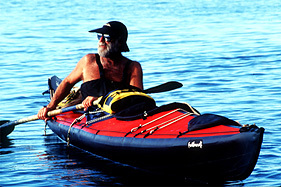 Since 1975 I have logged more than 20,000 miles of kayaking throughout the Hawaiian Islands, spending days and nights eating and sleeping from my ocean kayak, while whales, porpoise and dolphins frequently lie by my side. Free to come and go as they please - free to have that choice. We have come a long way in understanding the compassion and intelligence within the societies of whales, porpoise and dolphins. Through this process of (Captivity) I personally feel it immoral to keep intelligence locked up. I am saddened when I see a species that has been victim to and oil spill or other disaster- after rehabilitation the species is released - enabling it to rejoin its kind. To be able to live its life in a natural way, as it was meant to be. Confined within concrete walls, no matter how well the dolphin is treated it is not a natural way for any species to live a full-filling life. For a free roaming species to be confined within the walls of concrete for the purpose of scientific research - and - or for the purpose of show, has gone on long enough. True, in this over-populated society of human beings, many may never have the opportunity to see dolphins, whales or porpoise in the wild. However that is no reason to keep this species in captivity for mere enjoyment. Release the dolphin back into the sea, and feel within yourself what it must be like to stretch your body - swimming free without borders. Release a dolphin and allow it the freedom of having the choice of surfing waves, diving to the cooler depths, and through laminar flow - breaching high into breaking ocean waves, feeling the freshness and bite of the wind. Release the dolphin and feel the freedom of communicating, playing, and reproducing with others of your own kind. I believe one truly must live with nature to fully understand nature. My time at sea has always been far more rewarding than my existence on land. I can truly understand the freedom of the open ocean when kayaking inter-island between the islands of Maui, Lanai and Molokai or sailing on Trans-Pacific voyages - seeing hundreds of dolphins swimming in their ocean realm bordered only by continents thousands of miles apart. We talk of living in a democracy - free to choose - speak out - free to go where we please. But not free (in my opinion) to make the choice of bringing other intelligent species into captivity. Yes I agree, much has been learned from captivity, but enough is enough. It is past time to show our intelligence and allow the natural world to live in natural ways. We manicure this world to please ONLY ourselves on both land and sea - placing borders where nature can be viewed at our convenience. HOW ABSURD. DOLPHIN- A FREE roaming mammal found throughout the world's oceans. There are no confines large enough to justify CAPTIVITY. Someday perhaps common sense will be the rule for societies to live by. Not greed or for our own pleasure.